I’m getting seriously annoyed with Lonely Planet. Ok – It’s not completely wrong – in fact, it’s right about 90% of the time – but when they blow it – they mess me up. We had spotted the Fabrege Museum the first day we walked St. Petersburg. It’s a brand new museum, only open for about a year – and besides being in a glorious palace, it has the largest collection of Fabrege Easter Eggs in the world. Clearly – I want to see this. The guide book suggests that the only way to visit is by guided tour, and to arrange that – you must email them. So I do. And they reply – yes it’s by guided tour – English at 12:15 and 4:30. I reply by email – please reserve 3 tickets for Monday. We arrive – to be told – just asking for a reservation isn’t good enough – we don’t reserve tickets unless you give us a credit card number. Nice to know now of course. At this point, the English tour is sold out for 12:15 – you can join it anyway if you pay twice the normal price, or you can take the 4:30 tour – or you can come back in the evening and do a self-guided audio-tour. Wait a sec – you think I want to pay twice the normal price to make a tour group oversized so no one gets to enjoy it? What kind of logic is that? I don’t think so. But the evening option sounds actually grand – the only problem, MP is leaving tomorrow and we have theatre tickets for tonight. Re-group – quick discussion – and a new plan is formed. MP will forgo Faberge – she wasn’t that set on it – and we will do the long planned and not yet attempted boat cruise on the canels of St. Petersburg. There’s an English version that leaves at 1:30 – so that’s perfect. New plans all aligned – we implement! We buy our boat cruise tickets – we buy food for lunch al fresco – we go to the boat and enjoy our lunch waiting for the cruise to start. And it’s lovely – albeit a bit cold! The sun is shining, but this is an open deck on a moving boat on a river that just recently thawed! It’s a tad chilly. But clearly this is the norm – the boat crew hands out blankets as a matter of course! Snuggled in our warm fuzzy blankets – we watch the palaces of St. Pete’s slip by. The cruise takes us within spitting distance of our hostel entrance – then out onto the Neva River. We loop Peter and Paul Fortress – getting a closer look at the crazy people sun bathing – and then head back to the dock. 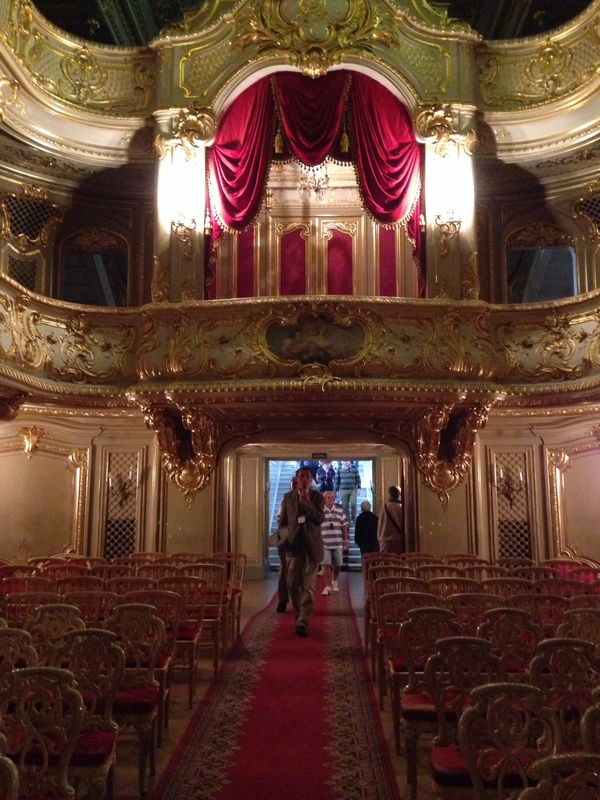 Once off the boat – we start the rather long journey to the Yusupov Palace and from there to the Mariinsky Theatre. We will not be late this time. We end up in the Hay Market section of St. Pete’s – all cleaned up and renovated today, but the home of the anti-hero of Dostoyevsky’s 1866 – Crime and Punishment. Hard to imagine that today in the sunshine – but Dostoyevsky was living in the slums in this area at that time – and accurately placed his characters among these streets. Today there is a lovely narrow canel running down the middle of the road – and folk singers entertain the folks exiting the metro station with Russian Dance music. It’s a fun spot – spooky history aside. Lupper (combo of late lunch, early dinner) is at a neighborhood ‘cafeteria’. Walk down some stairs into the basement – and you are in a square room, 8 tables and a tiny cafeteria line. Grab a tray and point out what you’d like. The owner/chef/cook/bottle washer puts it on a plate and reheats it for you in the Microwave. MP has Goulash, IT and I split some delicously flavorful rice and a piece of chicken. The only 20th century nod, beside the microwave, are 2 huge flat screen TV’s broadcasting a soccer game. Fortunately the sound is off – so our dinner is quite pleasant. While early, the palace is not empty – a smattering of older women and young student types fill the other tables. No one gives us a second look – and we are free to relax over our meal. Next stop – Yusupov Palace – famed for being the site of Grigori Rasputin’s murder – December 17, 1916. We get our tickets – do the line, back-pack, line routine – and only then discover that the visit to the room where Rasputin was poisened and stabbed is a no go. Only 10 tickets a day are available for individual tourists – all the rest go to tour groups – and they are sold out. But we smartly decide that since we’ve already paid to visit the palace – we’ll just have to skip that part. Great plan – the house is amazing. This was the home of the Yusupov Family – who can trace their routes back to a Tarter Lord who threw in his fortune with Peter the Great. As a reward for his service, Peter gave him money and land – and from this begining the family fortune grew. The Palace is more stunning than the Hermitage in many ways. Part of it’s advantage – aside from the magnificant public spaces – including a ball room to die for – is it’s ‘live-ability’. Unlike the Hermitage, which one can’t imaging actually living in – the Yusupov Palace feels more like family. There’s a state dining room with floor to high high ceiling wood walls, glorious grand staircase – marble of course – and the mandatory chapel. There are also the rooms used to display their many art works – all of which became the property of the state after the rebellion. Today the walls are bare – but there are photo’s of the glory that once was. After our tour – MP is still hungry – and there’s time before the theatre starts – so we pop into the Shamrock – a local Irish pub – Russian style. There MP gets a bowl of Solianka, a traditional Russian meat soup – served with sour creme of course. It’s yummy. Tonight’s theatre is Aida – 3 hours of opera that flys by. The soprano who sings the role of Aida’s tormentor – the haughty daughter of the Pharoah – is completely outstanding. I totally bought her self-righteousness and displain for the lower classes – which as a slave makes Aida below her notice. She convinced me – and I loved her for it. The tenor singing the role of Rameses – half of the pair of star crossed lovers – was also excellent. But what really made the show were the incredible stage sets. Where do they find the space to put all these sets? The Opera calls for 8 different locations – and each one was fully realized in this over the top spectacular production. The trip to the temple of Isis is done by boat, the inside of the temple of Vulcan features red lighting, Mysterious Priestesses, smoking gigantic urns and numerous priests – and the triumphant return of Rameses to the city left me agasp. I guess if you’ve got an endless supply of dancers and singers – you might as well get them all on the stage. But again it’s the perfection in the ensemble routines that leaves me speechless. There is something happening at the theatre every night for 2 months – but they are only performing this particular Opera twice this month. How do the ensembles remember the complex staging over the weeks between performances? I have no idea. Appaluse, line up to retreive back-pack, line-up to go the the bathroom – and home. Wait, so how are you supposed to reserve them?? Telepathy? Buy the tickets there for another day? Show up at the crack of dawn?